For the past three years, outdoor gear retailer REI has opted out of participating in the consumer frenzy that is Black Friday, choosing instead to close its stores, give employees a paid day off and encourage both its members and non-members to spend time outdoors. The endeavor was dubbed #OptOutside, and has since become a yearly cornerstone at REI, galvanizing its community around the brand’s ethos of mental and physical wellbeing through connection with nature. This year, in the context of the fourth iteration of #OptOutside, REI is investing $1 million in research at the University of Washington to study the link between our health and the time we spend outdoors. Ben Steele, EVP and chief customer officer, spoke to PSFK in a podcast interview about putting purpose over profit, about how #OptOutside engages REI’s vast customer base, and why REI might be the original lifestyle brand without calling itself as such. How would you describe REI and the concept of the co-op? Ben Steele: We’re celebrating our 80th anniversary this year as an organization that, since our founding in 1938, has been focused on awakening and enabling a lifelong love of the outdoors. 80 years ago, it started with 23 friends coming together, cooperating to purchase ice axes to help them make mountain ascents that they wanted to do. Today, we’ve got more than 17 million members, 155 stores, and a really vibrant community of people who are still organized around the idea of loving a life outdoors. How does the co-op system help drive loyalty with customers for the brand? The co-op is a unique structure. Our customers are our members and our members are our owners. People pay $20 for a lifetime membership in the co-op. As I said, we’ve got 17 million of those members right now, some of them going back to those very early days. They are a part of something that is different than a standard business. On a lot of their purchases, they get a dividend back at the end of the year. Between that dividend and the contributions we make to outdoor spaces, REI gives nearly 70 cents of every dollar back, every dollar of profit back at the end of the year to our membership to employ profit sharing, and to hundreds of outdoor organizations that build and steward the trails and network of resources that help us all live that life outdoors. Could you explain REI’s brand ethos and the work that you do? Our mission has always been enabling and awakening that lifelong love [of the outdoors]. We aim to really focus intentionally around solving problems for customers and our members of today, in the world we live in today with all the distractions, and dizziness and presence of technology. Those problems are different than they were 80 years ago. They’re different than they even were 10 years ago. My team and I are really focused on organizing our work that way and innovating the solutions for our customers and members. This is the fourth year that you are continuing the #OptOutside campaign. Could you explain the original concept, and what this year is bringing about? For the fourth year now in a row, we’re closing our doors on Black Friday. We’re going to pay every one of our employees to spend the day outdoors with the people they love, and the places they love. We’re inviting the world to join us, inviting millions of people to join that movement, and spend time in the places they love with the people they love. We did that for the first time four years ago. I think we were extraordinarily excited about the idea as an organization. This notion of demonstrating to ourselves and to each other, what does it mean to put purpose above profit? What does it mean to put your values first? Over the first three years, we’ve had more than 15 million people raise their hands and say, “I want to OptOutside with you.” We’ve had hundreds of organizations. We’ve had State Park systems. We’ve had other retailers join the movement. We’re thrilled to continue what has really become a new tradition for the co-op, and in many people’s lives, a new tradition for what the Thanksgiving season means. What’s the angle for this year’s OptOutside? The angle is we’re still closing our doors on Black Friday. It’s really always about the basis of that. We really try to stay focused on why we do this, what’s most important, and that core choice of how we want to spend our time, how we want to encourage and model for people to spend their time. I think what’s different this year is honestly the cultural moment around us. I think four years ago, we saw this moment of rampant consumerism. I think if we look today, there’s a slightly different cultural tension. There’s this idea of how complex, and busy, and overwhelmed our lives are. We’re connected more than we’ve ever been, but in some ways, we feel more isolated than we’ve been, and feel more anxious and overwhelmed—that tension of how I feel and what my life looks like, and how many of those things are maybe unconscious choices. We want to go back to that basic idea of, what is a choice? What is the power to make a choice to opt to something different? We’re spending a ton of our time looking down at devices and phone screens, rather than looking up at the world around us. This is a moment where we can take a breath, and take a pause, and remind ourselves and each other that that is a choice. We can make a different choice. The official language used to describe this year’s OptOutside puts an emphasis on health and wellness, which is a major consumer trend. Is that a trend that you’ve recognized at REI and that you relate to? I think it’s a good question. In reality, the co-op has always been about healthy moments—time in the outdoors, the exercise, the fellowship, the discovery. Everything from physically pushing myself to something different, to literally taking a breath of fresh air, seeing a view that inspires me, I think today what we call mindfulness or presence. Maybe 80 years ago, they just called it stepping outside. It’s interesting to see how that develops as a trend. For us, it’s always about the truth of what is the quality of life outdoors. We talk about a life outdoors as a life well lived. That’s an organizing idea for us. If you start to break down what does life well lived means, yeah, it is about health. It is about wellness. It is about peace. It is about connection. Those things happen outdoors, in ways that are incredible. When you step into the outdoors…it doesn’t have to be six hours from the city. It can be a park or in your own backyard. When you step into an outdoor space, everything changes. I think we want to remind people that that simple first step, that moment, that choice, can start a different pattern, can break a loop that maybe you didn’t even realize you were in, and start something new. That is a path toward health and wellness, in a lot of ways. As a part of that, this year the other thing that’s a little bit unique, is we’re in a partnership with the University of Washington. We’re going to invest a million dollars in helping them study and explore what the link is between physical and mental health and how much time we spend in the outdoors. There’s science behind it now, in ways that there hasn’t been before. The University of Washington’s health and nature initiative is a part of their college of environment Earth lab. That body of research is really focused on what happens physically when I step into the outdoors, what happens with mental health? What happens when I go to these places and enter this different mind state? That work and that research, we really hope will continue to drive a trend that gets more people than ever outdoors. 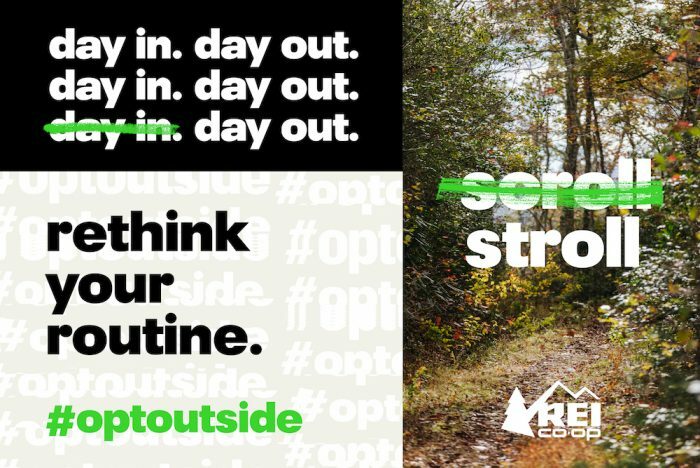 Explain why, for a campaign where you are asking people to disconnect and engage more in real life, you have chosen to frame OptOutside within the bounds of a social media hashtag. We talk a lot about the duality of things like technology. Again, back to that idea of choice: I can use technology to enable me to do a lot of interesting things, or I can use it to distract me from those things. If you think about the outdoors, we have amazing, amazing online tools. We have these incredible apps that can show you a trail near you, can connect you with another member in our community who can tell you all about that trail, and what the conditions are like that day, that can show you a picture that will inspire you to do something different. That’s technology acting, to get me closer to the choice and the action that is going to make me feel and live a different life. There’s obviously other things that technology can do. We want to be realistic and honest about how people live their lives. If people share the stuff that inspires them in a space like social media, and something as simple as a hashtag helps them communicate in shorthand a big idea, then that’s the way we want to help them. That’s the toolkit that we want to give them. I think what we’re heartened by is while there have been 10 million #OptOutside posts on Instagram, and there have been almost three‑quarters of a million tweets on Twitter about it, what’s more important is most of those pictures are of somebody outside. Most of those tweets are about the amazing thing I’m going to go do, or inviting somebody else to do it with me. It’s an online action connected to a real choice, and a real step into the outdoors. For us, there’s nothing wrong with that. That’s all good. Is the corporate responsibility that people associate with REI, and that brand of activism that is at the core of the REI brand, one of the specific reasons why REI customers shop with you? I very much hope so. I think when we think about membership, it’s about a lot more than a dividend. It’s about a set of beliefs. It’s about an idea. It’s about values that they see reflected in the organization that they’re a part of. While there are very specific benefits, there is also that notion of belief and alignment. I think as an organization, as a brand, as any company, when your values and actions can help people see who you are and what you stand for, in ways that they want to be a part of—that’s a powerful thing. Responsibility is something we talk a lot about. We believe we are stewards of the outdoors. We have been for 80 years. We think a big part of the responsibility of the co-op is to impact the outdoors, and the outdoor space in a positive way. Again, that purpose is a bigger idea to us than the day-to-day running of a business. How would you describe the REI customer? The interesting thing is with 17 million members, it’s almost impossible to describe the REI customer. It’s everything from somebody who may have a three or four digit membership number from the early days of the co-op, to a young person living in the middle of New York City in an apartment. A few years ago for the first time, millennials became the biggest cohort in our new member group. We have about a million members a year join the co-op. A couple years ago, that tipped. That went from the generations prior to that, to being a millennial group. As we look at that, as we look at the literal and figurative face of the outdoors changing, it’s important that as a co-op we serve what the outdoors means to those new generations. It’s an incredibly diverse group of people that span the country and span beyond the country, and I think fit every single shape of what an outdoor life could look like. Would you use the term lifestyle brand to refer to REI? We talk a lot more about values and purpose than we talk about lifestyle. I think, for a lot of people, those ideas are similar. It’s about identity, it’s about alignment of beliefs. Our focus is not on lifestyle—our focus is on a life well lived. Our focus is on the purpose of this organization. At the end of the day, we talk a lot about quality gear, we talk about expertise, we talk about solving customer problems, we talk about experiences. We have this incredible travel business that puts people in incredible adventures around the world. We have the biggest outdoor education school in the country, almost 400,000 people last year doing classes and workshops. There’s all these different aspects of what we do, that ultimately are about a lifestyle that is a life outdoors. It’s a different path to that outcome. Have you taken and incorporated any consumer feedback from the previous iterations of OptOutside? In that second year, we had a lot of organizations, a lot of philanthropic organizations and groups say, “I want to be a part of it.” That second year we said, “Look, if we have an opportunity to really grow a movement, let’s do it.” We very much connected with 700 different organizations and grew the span and the size of that movement by asking them to invite their folks into the outdoors. In the third year, we had seen at that point millions of moments of people sharing their best days, using the language of OptOutside. We created a visual repository of those best moments and asked people to share and to inspire each other. This fourth year we see the core of the idea being the same, but we see the context around it evolving. We want to use it as a moment to remind people that they have a choice about the life that they want to live. The presence of the outdoors will only make it better. 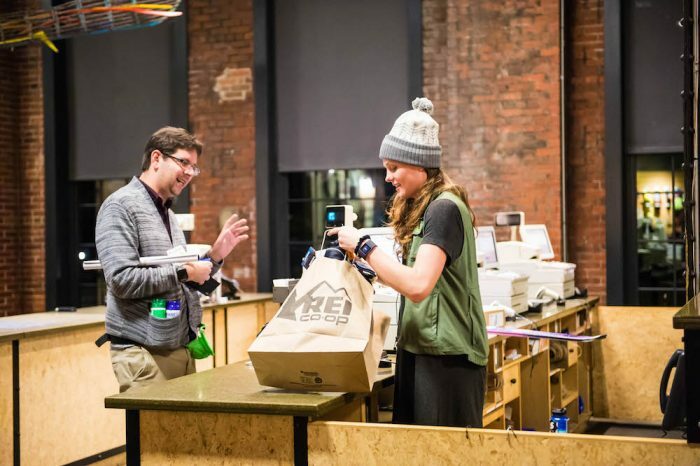 Thanks to its unique co-op format and strong brand values, REI is a pioneer in customer loyalty. For more from Ben, listen to the podcast, and for more ideas from similar inspiring brands, see PSFK’s reports or newsletters.